The Austrian Mint is the national mint of the Republic of Austria. It’s officially known by its German language name of Münze Österreich. The Mint, which is headquartered at 1 Am Heumarkt in Vienna, has been a fully-owned subsidiary of Oesterreichische Nationalbank (OeNB), Austria’s central bank, since 1989. Although most famous outside Austria as the producer of the internationally renowned Vienna Philharmonic series of gold bullion coins, the Austrian Mint also manufactures gold bullion bars, silver bullion coins, Austria’s circulation coinage, and coin blanks and coinage for many other mints around the world. The Mint is a crucial part of Austria’s gold market, and it interfaces with many other parts of the Austrian and wider gold market through its distribution channels and connections to banks and wholesalers. The Austrian Mint is one of the oldest mints in Europe. The present day Austrian Mint can trace its history back directly at least 600 years to 1397 to a mint which was located on Wollzeile, a street in the historic old town of Vienna. In 1752, that Mint relocated to the Winterpalace of Prince Eugene (Winterpalais Prinz Eugen) on nearby Himmelpfortgasse. In 1834, Kaiser Franz I ordered the construction of a new Vienna mint, a building which was constructed between 1835-1837 on Am Heumarkt, also near Himmelpfortgasse, to which the Winterpalace mint moved. This building on Am Heumarkt is the headquarters of the present day Münze Österreich. There are references to the minting of coins in Vienna in 1194, and the Austrian Mint sometimes uses 1194 as its historical inception date, for example, in 1994, the Mint held 800th anniversary commemorations based on this 1194 date. In the 1850s, the Am Heumarkt mint in Vienna became the leading mint of the Habsburg Empire. After the First Austrian Republic was established in 1918, the Vienna state mint became Austria’a only mint. The Mint issued the Austrian Schilling coinage beginning in 1925, issued the German Reichsmark from 1938 to 1945 when under German rule, and issued the Schilling again from 1945 until 2001 after which time it began issuing Austria’s Euro coinage. In 1989, the Vienna state mint was incorporated as a public company named the Münze Österreich AG (Austrian Mint AG), and simultaneously it became a fully-owned subsidiary of Austria’s central bank. These changes were marked by the launch of the now famous Weiner Philharmoniker, or Vienna Philharmonic gold bullion coin in 1 ounce and 1/4 ounce denominations. In 1991, a 1/10 ounce gold bullion Philharmonic coin was launched. This was followed in 1994 by the launch of the 1/2 ounce gold bullion Philharmonic. Most recently, a 1/25 ounce gold bullion Philharmonic coin was introduced in 2014 to celebrate the 25th anniversary of the Philharmonic’s 1989 launch. The Austrian Mint is managed by a CEO and overseen by an executive board. It is fully owned by the Oesterreichische Nationalbank, Austria’s central bank. As a fully-owned holding of the Austrian central bank, the central bank receives significant annual income from the Austrian Mint in the form of capitalising a dividend claim on the Austrian Mint, as well as receiving an actual annual dividend from the Mint. For 2015, the OeNB received a regular dividend of Eur 89 million from MÜNZE, and also capitalised a dividend of Eur 564 million. The Austrian central bank is fully owned by the Austrian state, therefore ultimately, the Austrian Mint is fully backed by the state of Austria. In 2015, the Mint also transferred a 33.2% shareholding that it had previously held in Casinos Austria AG to an Austrian state holding company called Österreichische Bundes- und Industriebeteiligungsholding (ÖBIB) (Austrian State and Industrial Holding Ltd), which is operated by the Austrian Finance Ministry. This transfer of ownership was also accounted for as income to the central bank in the amount of EUR 83 million. The Austrian Mint is one of four shareholders in Argor-Heraeus, one of Switzerland’s largest precious metals refineries. Argor-Heraeus’s three other shareholders are German refiner Heraeus, German bank Commerzbank, and Argor-Heraeus management. The Austrian Mint owns approximately 24% of Argor-Heraeus. Partial ownership of a major Swiss precious metals refinery ensures preferential access by the Mint to upstream precious metals supply. The Austrian Mint’s annual financial results and report are published in June/July of each year covering the preceding financial year. For the year to December 2014, the Mint generated a turnover of EUR 1.141 billion, with the biggest revenue contributions from gold bullion coin sales, EUR 464.2 million, and gold bullion bar sales, EUR 391.7 million. Together gold coin and bar sales represented a combined 75% of total revenues. In total, the Mint sold 483,700 fine troy ozs (15 tones) of gold coins in 2014, and 410,364 fine troy ozs of gold bars (12.75 tonnes), as well as silver coins containing approximately 144.4 tons of pure silver. Total gold sold was therefore 894,000 ozs (27.75 tonnes). Interestingly, gold bar sales from the Mint account for nearly as much as gold coin sales, and notably the Mint sells less silver proportionately than gold compared to other national mints such as the US Mint and Royal Canadian Mint. Although the Mint’s 2015 financial results have not yet been released, in April 2016 the Mint revealed to Bloomberg in an interview that combined gold coin and gold bars sales for 2015 totaled 1.32 million ounces (41 tonnes), up 45% from 2014, while silver sales for 2015 totaled 7.3 million ounces (227 tonnes), up 57% from 2014. The Vienna Philharmonic, the Mint’s flagship gold bullion coin, accounts for the lion’s share of the Mint’s gold coin sales. The largest markets for the Vienna Philharmonic gold coins are Europe, North America and Japan, in that order, and the coin is the highest selling gold coin in Japan, where Tanaka is the Philharmonic’s sole distributor. Overall, approximately 30% of the Mint’s sales come from markets outside of Austria, meaning that the Austrian market still comprises about 70% of revenues. This demand pattern is explained by the fact that the domestic Austrian market is one of the largest individual markets for gold coin and bar demand in Europe, and ranks 3rd behind Germany and Switzerland. The Austrian Mint’s largest markets for silver bullion coins are Europe and North America, although a recent increase of VAT rates on silver in Germany, one of the Mint’s largest markets for silver, has had a material impact on the Mint’s silver sales. The Mint group’s remaining revenues came from such product lines as production and sales of collector and commemorative coins, Euro circulation coins, Euro proof coins, medals and special products, foreign circulation coins, and semi-finished products. The Vienna Philharmonic gold bullion coin series is a range of .9999 fine gold coins available in the following denominations: 1 oz, 1/2 oz, 1/4 oz, 1/10 oz and 1/25 oz. The 1 oz denomination contains exactly 1 troy ounce (31.1 grams) of fine gold. Gold Vienna Philharmonic coins are legal tender coins in the Eurozone and are therefore VAT free in the Eurozone given that they are legal tender coins. Up until 2001, the gold Vienna Philharmonic was issued with a face value denominated in Austrian Schillings. In 2002, when national coinages of initial Eurozone members were phased out, the gold Vienna Philharmonic began to be issued in Euro face value denominations. The name of the Vienna Philharmonic comes from the fact that the design of the coin celebrates the world-famous Vienna Philharmonic orchestra. The obverse of the coin features the pipe organ of the Vienna Concert Hall, while the reverse of the coin depicts a series of musical instruments present in the orchestra, namely a cello, four violins, a harp, a Viennese horn and a bassoon. 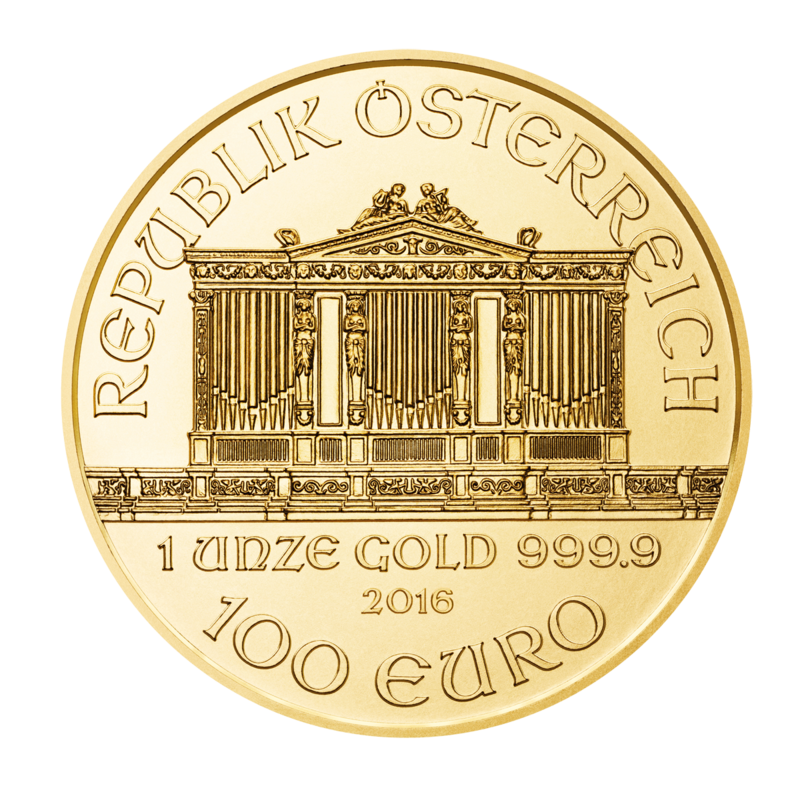 When Münze Österreich AG was formed in 1989 and became a subsidiary of the Austrian central bank, the Mint launched its Vienna Philharmonic gold bullion coin range in October of the same year with the release of the 1 oz and 1.4 oz denominations. The 1/10 oz Vienna Philharmonic gold bullion coin was first issued in 1991, followed by a 1/2 oz denomination in 1994. In 2009, to commemorate the Vienna Philharmonic’s 20th anniversary since launch, the Austrian Mint issued a 20 oz version of the coin, just for that year. In 2004, for the coin’s 15th anniversary, the Mint issued a massive 1000 oz gold coin version of the Vienna Philharmonic, again, just for that year. For the coin’s 25th anniversary in 2014, the Mint issued a 1/25 oz denomination, which is still produced every year since then. Notably, in 2014, the Mint held 25th anniversary events for the Philharmonic in the following cities around the world: Berlin, Chicago, New York, Los Angeles,Beijing, Singapore, Tokyo and Vienna. These cities give a rough indicator of the markets which the Mint considers most important from a marketing perspective, i.e. Germany, USA, Japan, and other Asian markets such as Singapore and China. The Austrian Mint also produces the Vienna Philharmonic coin as a 99.9% pure silver coin (since 2008), and as a platinum coin. Both of these bullion coins are only issued in the 1 oz denomination. The silver coin is not VAT free in the EU. Münze Österreich also produces some other unique gold bullion coins in the form of historical restrikes of original Austrian circulation gold ducats, guilders and crowns. These coins bear the year of when the coins last circulated for trade purposes, for example, 1915 for the ducat. The Mint also manufactures gold bars in a range from 1 gram up to 1 kilogram, specifically in weights 1, 2, 5, 10, 20, 50, 100, 250, 500 grams, and a 1 kg bar. The Austrian Mint distributes its bullion coin and bar products via a number of routes. The Mint maintains two physical retail shops stocking its product range, one within its headquarters building at Am Heumarkt in Vienna, and the second in Innsbruck, the capital city of the Tyrol state in western Austria. Additionally, the Mint’s website offers an online store for purchasing bullion coins and bars, and other coins produced by the Mint. Since 2005, Münze Österreich AG has also held full ownership of Schoeller Münzhandel, one of the largest retail and wholesale coin and bullion trading companies in Austria and Central Europe. Schoeller Münzhandel is a major distributor of Austrian Mint bullion coins and bars, and has three retail offices in Austria in the cities of Vienna, Graz (Austria’s second largest city, in the state of Styria), and Innsbruck. Schoeller Münzhandel sells into 36 countries, mainly in Central and Eastern Europe (CEE), and it also has a branch office in Freiburg in Germany . As a diversification strategy to counter the closure of bank branch offices within Austria, the Mint also utilises the branch network of Austria’s national postal system, Austrian Post to distribute its products. Recently, the Mint has also begun working with Austrian jewellery chain Dorotheum Jeweller to stock the Mint’s products. Internationally, the Austrian Mint maintains a large network of coin shop dealers in 27 countries with which it has negotiated to stock its bullion products. These dealers are in addition to the world’s largest bullion wholesalers such as A-Mark from which many other dealers purchase from. Note that A-Mark itself has a European branch in Vienna, another indication of the importance of the Austrian gold market within a European context.